That salad looks incredible ! Love all the different flavors in that refreshing dish ! Your dressing sounds yummy as well ! Such a healthy and flavorful salad! Cool! Nothing could be fresher than this home-grown + home-made salad. Worth waiting for weeks : ). That's a beautiful, fresh spring salad! !So many things you can make with spinach. Incredibly lovely!!! Im motivated to grow baby spinach now!!! Lovely plate of salad, delicious with homegrown greens! Love it! Lovely! I am envious of your spinach, they look so healthy! A delightful salad! What a great combination. A healthy, fresh and full of flavour dish. Makes a good wholesome lunch. Well done! I love those greens!! !, looks so fresh and delicious!!! This salad looks lovely and your windowsill spinach growing exprience is very tempting... I might try to plant it alongside my herbs. Thank you for the encouragement. Spinach is always my favorite. Wow, what a beautiful pot of baby spinach! And the salad looks amazing too. I would eat sweet potatoes everyday if I could. Can't wait to try this recipe! I love that you used your own home grown spinach. I've never tried growing my own but would love to try now. This dish is beautiful and with few ingredients is packed with flavor, color and nutrition. I look forward to making this. Wat a healthy,colourful and healthy salad. What an interesting combination of flavors. Your spinach is beautiful! Happy gardening! I've made a salad with all of these ingredients before and loved it! So tasty. What a pretty looking salad! I love the idea of sweet potatoes and spinach paired together. what a delicious salad! I LOVE your garden, I wish I could get spinach to grow that well here. Great recipe. Perfect for summer! Well done! What a great looking salad, Angie! I love your addition of sweet potato, too - so creative. Looks so fresh and tasty! your home-grown looks so fresh and green! love the colours. Oh never thought of growing salad or spinach myself in a flower box. Noted for next year! Love the key flavors here with the sweet potatoes and feta. This is a fantastic looking salad! I love sweet potatoes any way I can get them. They would be delicious in this baby spinach salad. I love Spinach Salad is this one looks and sounds fantastic! Thank you for your visit Angie. You have a great blog. This salad looks awesome! I love baked sweet potatoes! Aahhhh !!! What nice pics, soo captivating ! Wow, Angie, you are sooooo lucky to have fresh baby spinach in your garden; it looks incredible and I'm certain tastes amazing. Paired with the wonderful roasted sweet potato and feta, now that's a meal I can totally get into. Wonderful! I usually do this type of salad with goats cheese. YUMMY either way. What a great looking and really creative salad! and a beautiful green garden! I can eat a few servings of your salad and not feel guilty that I overate. Salad looks very lite and at the same time very appetizing especially with those roasted potatoes. To me, that's another winner, Angie! You are so right - I love fresh from the garden produce and herbs. This salad is right up my alley! I am so incredibly jealous that you grow your own spinach! I live in an apt so there's just no way I could grow them. I bet your salad was so fresh! That salad looks so good,Angie!Perfect for lunch! What a lovely idea! I'm loving feta this time of year... beautiful salad Angie. That spinach is simply gorgeous! In fact the entire salad is, and so delightful! Hope you are having an amazing week...hugs! I am loving everything about this beautiful salad. What a simple and delicious looking salad! Can't wait until my spinach gets big enough to start picking because you're right - nothing better than greens picked from your own garden! Great combination of flavors! Very colorful! Love the presentation. I love sweet potato! Sounds like a great combination -- never had it with feta before! wow, this salad must be very refreshing and healthy because it is from your garden..lovely! Presently the zucchini is overtaking the garden. I just had to cut it back yesterday. I should have planted my herbs in another grow box. Your spinach looks so healthy and vibrant! Also, this is a very creative use of sweet potatoes and I am sure all the flavor elements you pulled together makes for one delicious bite. Enjoy the weekend Angie! I see that you are in a salad mood too Angie! Great looking salad! I love baby spinach! This is a refreshing and light salad a perfect lunch. I love to grow my own greens: cheap and tasty. Your container of growing baby spinach is fantastic! And, what a great salad. Love this mix of flavors. Never seen this particular salad recipe but I love the combination of ingredients. Happy holiday weekend! I had little luck with spinach :( chard and salad worked out great though! This looks so delicious and how awesome that the greens are home grown and home picked! you finally managed to get sweet potatoes! i'm falling in love with your salad again! this really sounds very good and looks so appealing to me!! I would love to have that spinach in my window sill. Lovely salad! Nothing like picking fresh greens from your garden for an amazing salad, delicious! I love your baby spinach bed!!! I've never tried growing spinach and failed miserably at growing lettuce. The sweet potatoes are such a delicious addition! Thank you so much for your kind and caring thoughts and words on my blog. I also left a reply for you on my blog! 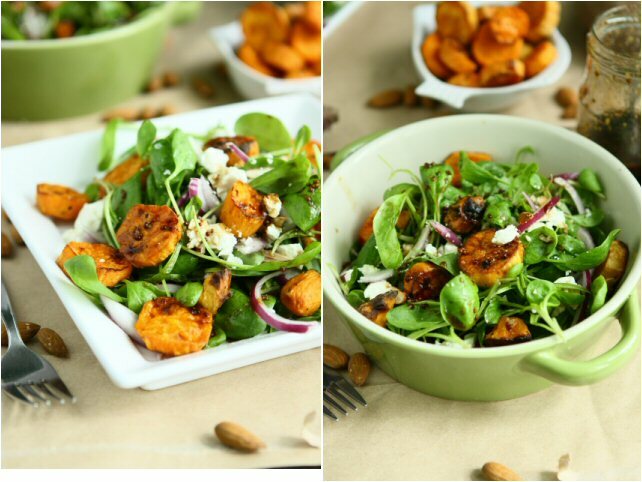 Angie, I love everything about this salad…baby greens, sweet potatoes, almonds and a yummy dressing! Love that you’re growing your own spinach on the window sill…what a great idea! That looks like a great, healthy salad recipe! Love it! this is so Gorgeous you would have to want and eat this! what a lovely simple and delicious idea for a salad. You have me inspired. Delicious salad! Congrats on making it to Foodbuzz top 9 :-). Buzzed. What a gorgeous salad. I love it!!! What a beautiful fresh salad! So perfect for spring. The salad looks so tasty and colorful! I love the idea of grilled sweet potato slices. And nothing can beat the freshness of home-grown spinach! i've never seen sweet potatoes like this in a salad before--creative thinking, angie! looks great! I love sweet potatoes in any format! This salad looks wonderful. What a great blog, Angie. I am so happy to discover it. This salad is full of flavors that I love-am bookmarking it to use soon. Your garden box of spinach looks incredible. I adore the contrast of baby spinach with roasted sweet potatoes. I probably make a hash with that combination more frequently than any other. Beautiful pics! What a wonderful way to use your homegrown spinach. It looks so pretty on the plate. Angie, I love putting different sorts of things in salads. Will definitely be trying sweet potatoes! Gorgeous! You grow your own spinach! So cool. I wish I could too. I like spinach and eat it every day because of my iron deficiency. The salad combination and dressing sounds like a great mix. This salad looks delicious! I agree...anything home-grown is best...and so much more satisfying :) Thanks for visiting my blog...I did chuckle at your story with the rice and the pressure cooker! I must admit, I was a bit nervous using it, but mum was paying close attention! I have been rocking sweet potatoes in everything lately - salad is so next! Stunning and simple = the perfect salad! This is my kind of salad! I love sweet potatoes. And everything else you threw in this one. I made this salad yesterday - delicious! An unusual combination of flavours and one I'll definitely use again. I found the balsamic in the dressing overpowering (recipe says : 3 tablespoons balsamic to 1 tablespoon olive oil) and will add more oil to dress/coat salad next time. Otherwise yum! I love sweet potato salads. OK, I love sweet potatoes in anything. This is a wonderful combination and it presents beautifully. I know this is an older recipe but I just found it and plan to make it. Just tried it and it is delicious and easy! Yummy. Interesting combination, salad looks delicious..